You know the pattern all too well. One of you wanders onto the topic you’ve been fighting about for weeks, months – maybe even years. Before you know it, you’re both furious, tossing blame back and forth like a hot potato and getting absolutely NOWHERE with each other. Is there a way out of this vicious, unproductive cycle? After decades of working with couples, I’m happy to confirm the answer is yes. Healing the pattern begins with the realization that it takes two brains to create one messy, ongoing fight. The prefrontal cortex, which is the part of our brain that helps us think rationally and solve problems. The limbic system, which is triggered when we experience the “fight, flight or freeze” response. We need the limbic system to initiate fast action when our lives are threatened. The trouble is that this sensitive system can’t always tell the difference between a serious threat – like a burglar breaking into our home – and a milder one, like a flood of angry words from our spouse. When we sense we’re under attack, we’re flooded with defensive feelings, and our ability to think clearly goes right out the window. Problems between partners don’t get solved when emotions take over. To stop repetitive arguments, we need help from the prefrontal cortex so that objectivity and fairness can come back into the room. Fortunately, we can train our brains to help us manage conflict better. Here are 7 steps I recommend to couples who want to stop arguing over the same old stuff. 1. Understand the difference between reacting and responding. Strong emotions push us to react to things — often in a heated, irrational way. We have the choice, however, to respond in a more thoughtful, less defensive way. Knowing the difference is where change begins. 2. Practice observing yourself when you feel a fight coming on. Is your heart racing? 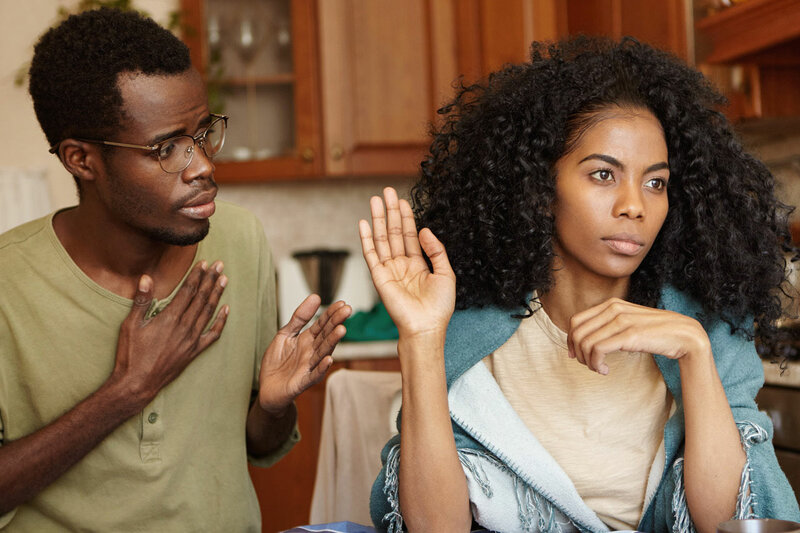 Are you talking over your partner, blocking out what s/he is saying? With a little experience, you’ll be able to tell when your emotions are threatening to spark a new battle. 3. When you feel angry and reactive, use simple techniques to calm down. Deep breathing works well. Fill your lungs and push the air slowly out of your mouth. You can also repeat your phone number backwards – it will activate your thinking brain. These steps may be all you need to move the conversation to calmer ground. 4. If you can’t cool off, request a break. Simply say, “I’m very upset and I can’t think clearly. Let’s come back in an hour or so.” During your break, try listening to music, dancing, even taking a short walk to clear your system of negative feelings. 5. Keep your promise to revisit the issue. Taking a break does NOT mean burying the source of conflict. You’re fighting because there’s a difference you need to address. The goal is to regain your balance and come back together in a constructive way, without excuses or delays. 6. Focus on understanding. As you re-engage your partner, think beyond the rigid confines of who’s right or wrong. Imagine yourself as two people with differing views who are capable of finding solutions. Listen to your partner’s point of view with an open mind and state your own concerns calmly and clearly. Understanding seeds the ground for long-term solutions. 7. Show gratitude for progress. Thank your partner for working with you to break the cycle. Remind each other that a calm conversation about a tough topic is a HUGE win, all by itself. If you think about it, that’s how all our differences are ultimately solved – one day and one conversation at a time. I have worked with hundreds of couples to develop stronger communication and problem-solving skills. If you and your partner need help, I am ready to meet with you. Reach out to me here.